Flick accepts Stuarts marriage proposal, and then Stuart gives her an engagement ring which she thinks is beautiful, and they kiss. Nina drops her bag in the corridor as Taj walks past, to which he helps her pick them up. Taj apologises for coming across rude to her before when Nina accused him of being the one sending her the creepy text messages. Nina hurries off embarrassed, while Taj seems frustrated he didn't get to talk to her more. The Scully's are preparing for Flick's farewell dinner, wondering where she is. "Only Flick could be late for her own farewell dinner' comments Lyn, but then Flick and Stuart walk in just at that moment, as if by clockwork. Stuart has some champagne in his hand, then Flick and Stu announce there engagement to mixed reactions of excitement (Michelle, Connor, Steph and even Joe) and shock (Lyn)! Lyn joins in the excitement, and comments that the ring is beautiful and that it must have cost a lot. Lori and Jack walk in; 'Did we miss something?'. 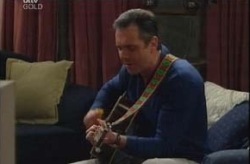 Karl is singing along to his guitar to which Susan doesn't look amused. She interrupts him to tell him dinner's ready, but it doesn't stop him playing for a bit longer. Susan appears more frustrated, but doesn't want to hurt Karl's feelings. She's relieved when there's a knock at the door - It's Harold. Susan encourages Harold to stay for a chat (if only to stop Karl from singing any longer). Karl offers to play for Harold, but Susan gently persuades him not to, and as Karl takes his guitar out of the way Susan tells Harold Karl's other songs are awful and that he was a 'one hit wonder' with 'Free as a river'! Harold's doesn't seem surprised! The Scully's, Connor and Stuart are sitting in the lounge after their farewell dinner for Flick. They discuss how good the meal was and how Flick and Stu will have to wait till after Flick comes home for their wedding. Flick goes to make coffee while Michelle asks Stu how he'll cope without Flick while she's away, to which he replies he'll have to take up a hobby. Connor jokingly suggests Knitting! Steph joins Flick in the kitchen to tell her how happy she is for her and they share a big hug together. Later on, Joe gathers everyone in the lounge to give Flick a farewell speech to tell her how much they'll all miss her. Karl is raving to Susan about how impressed he is that all his songwriting skills are flooding back to him after all these years. Susan tries to be enthusiastic. Karl tells Susan that he loves her and that there isn't anything he wouldn't do for her. Susan then takes this opportunity to ask him whether if would consider 'not' doing something for her. Karl misunderstands, thinking she is asking him to skip work to spend time together but says he has to work today. Susan gives up; fed up that she can't bring herself to tell him she doesn't want him to sing at the wedding! Harold comes over and tells Susan he has a solution - they need to get someone talented to perform at the wedding, someone who will do it for free, so that Karl will agree. Susan looks distraught, thinking Harold is suggesting he performs at the wedding. Flick is packing, amongst comments from Joe and Stu about the amount of clothes she's taking! Susan comes around, panicking to Lyn that her wedding is going to be a disaster as now both Karl and Harold want to perform. Nina and Michelle are still trying to figure out who sent the text messages. Taj walks past and says 'hi', to which Nina seems a little flustered. Michelle tells her she's hopeless, as Taj obviously likes her. Michelle encourages Nina to talk to Taj. Nina plucks up the courage to ask Taj out for coffee. Flick is about to leave when Stu drives up the street in a Limo to take her to the airport as a surprise. She says her goodbyes to Susan and Karl who are in the street, and then she and the rest of the family go off to the airport in the Limo. Susan has jut told Karl she doesn't want him to sing at the wedding. Karl is obviously a little taken aback by this news. However he starts laughing as he reminds Susan she never used to like his music in the past either. Susan then lets it slip that she might have accidentally agreed to let Harold sing at the wedding! Karl tells a bemused Harold that he doesn't think it's appropriate for him to sing at the wedding. Harold reveals he was talking about Nina! Taj and Nina are having their coffee date, which appears to be going well. Flick has just checked in, and is now surrounded by her family and Stu. Flick realizes she has forgotten her ring. Stuart decides to drive back and get it for her, promising Flick he'll be back in time to kiss her goodbye before she gets on the plane. Stu leaves the airport to find the Limo is jammed in the space by two other cars. Stu then borrows Jack's car. Stuart picks up Flick's ring from Number 26, while Flick anxiously waits at the airport. Stu is driving back when he is flashed down by the cops for speeding. The boarding call is announced for Flick's plane, and Lyn tells her she should go, to which she agrees. Flick says her goodbyes to Michelle, Jack, Lori, Connor, Steph, Lyn and Joe. Stu gets back at the last minute to kiss her goodbye. We see Flick on the plane, taking off for New York.